Sorokin A.A., Korolev S.P., Romanova I.M., Girina O.A., Urmanov I.P. 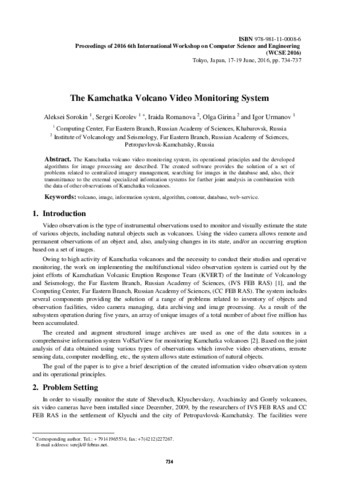 The Kamchatka volcano video monitoring system // 2016 6th International Workshop on Computer Science and Engineering (WCSE 2016). Tokyo, Japan: 2016. V. II. P. 734-737. Tanakadate H. Morphological Development of the Volcanic Islet Taketomi in the Kuriles // Proceedings of the Imperial Academy. 1934. V. 10. № 8. P. 494-497. doi: 10.2183/pjab1912.10.494. 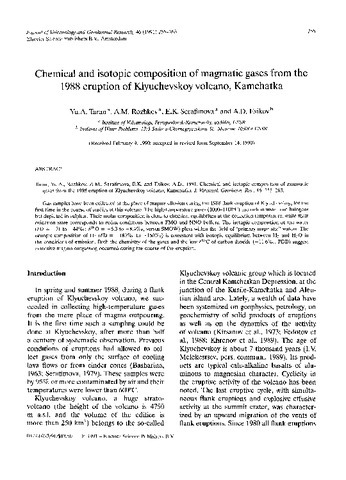 On the basis of the chemical, isotopic and thermodynamic characteristics of fluids sampled between 1964 and 1989 a genetic model description is given for fumaroles of the Mutnovsky volcano. There are three individual groups of fumaroles in the Mutnovsky crater which show stable activity for a long period of time: “the Active Funnel” (temperatures exceed 600°C), the “Upper Field” (up to 320°C) and the “Bottom Field” (from 100 to 150°C). The three principal zones of emission have different gas composition, water isotopic composition, radioactivity and 3He/4He ratios. The abundance of magmatic components in the high-temperature fumaroles of the “Active Funnel” is much higher than those in gases from the other groups. Emission rate of SO2 from the “Active Funnel” is about 200 t/d, which requires complete degassing as a minimum of 1 km3 of magma every 20 years. Fluids of the “Upper Field” contain up to 80% of steam from the Mutnovsky geothermal system. Temperature variations of the “Bottom Field” fumaroles (from 97°C before 1982 to 151°C in 1989) result from changes in hydrological conditions in the crater. Evaporation of high-saline acid brine which is formed in the interior of the volcano is responsible for the composition of the “Bottom Field” gas-steam discharges. Gas samples have been collected at the place of magma effusion during the 1988 flank eruption of Klyuchevskoy, for the first time in the course of studies at this volcano. The high-temperature gases (1000–1100°C) are rich in water and halogens but depleted in sulphur. Their molar composition is close to chemical equilibrium at the collection temperature, while their oxidation state corresponds to redox conditions between FMO and NNO buffers. The isotopic composition of the water (δD = −71 to −44‰; δ18O = +6.3 to +8.4‰, versus SMOW) plots within the field of “primary magmatic” waters. The isotopic composition of H2 (δD = −187‰ to −160‰) is consistent with isotopic equilibrium between H2 and H2O in the conditions of emission. Both the chemistry of the gases and the low δ13C of carbon dioxide (−11.6‰, PDB) suggest extensive magma outgassing occurred during the course of the eruption. Taran Yuri, Yurova L.M. Volcanic-hydrothermal system of Baransky volcano, Iturup, Kurile islands // IUGG XXI General Assembley. 1995. P. VA41C - 6.